What are My Decal and Vinyl Options? Decals are another option for personalizing your Mustang. 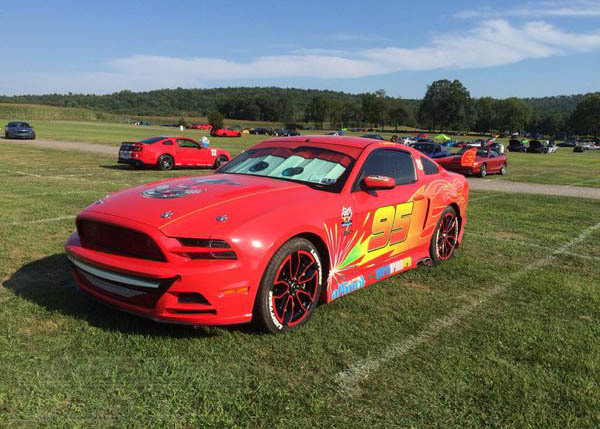 Stand out from the rest of the Mustang crowd and throw some decals on your ride. There quite a selection when it comes to decals for your Mustang so here’s a quick break down. 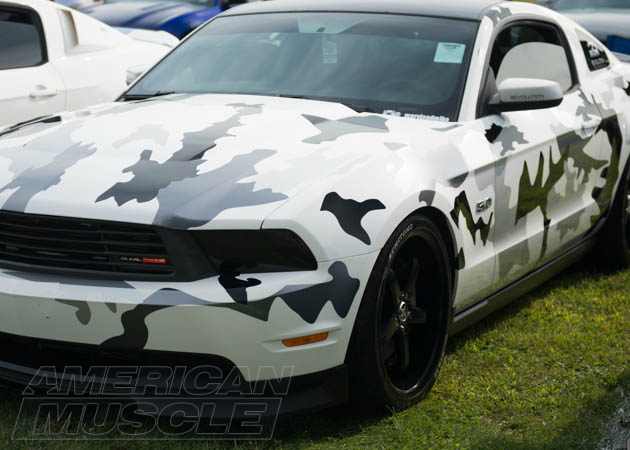 Mike's Coyote is showing you what a full camo vinyl wrap could do for your Mustang. When you decide to go with a decal that will be painted on your Mustang, you can assure that the quality will be better than any vinyl decal, assuming of course assuming you have a good painter. The two things to watch out for with painting decals is that 1. The price will be more than going with a vinyl sticker, and since they are being painted on they are permanent. Make sure you want to commit before opting for the new paint job. On the plus side, when you go with paint you can get anything you want, so show your creative side. The only downside to using decals for your Mustang is that if the vinyl is left on for an extremely long time and is taken off, the paint underneath the decal will appear to be noticeably newer then the rest of the paint. This can be adjusted for with a good car detail, or by protecting your Mustang’s paint job. Choosing to go with a vinyl decal can be beneficial in a couple of ways. They are by far less expensive than getting the decal painted on, and they are also not permanent. If you end up not liking the way your new decal looks, you can simply peel it off. Installing a vinyl decal is also fairly easy and can be done by almost anyone where, as a painted design must be done by a professional and can take up a couple of days of your time. For the rear bumper, you can purchase bumper letter inserts. They come in either stainless steel or vinyl material. Weather your bumper says “Mustang” or “Cobra” you have a nice selection of decals and you won't have a problem getting the look you want. There are also lower valence decals that will make your regular GT or V6 bumper different from the rest and rear bumper accents that are positioned on top of the bumper right underneath the license plate. Not only will this addition look great, but it will protect the top of your bumper from any scratches that may happen when placing something in the trunk. Trunk panel decals will help you achieve that retro muscle car look. 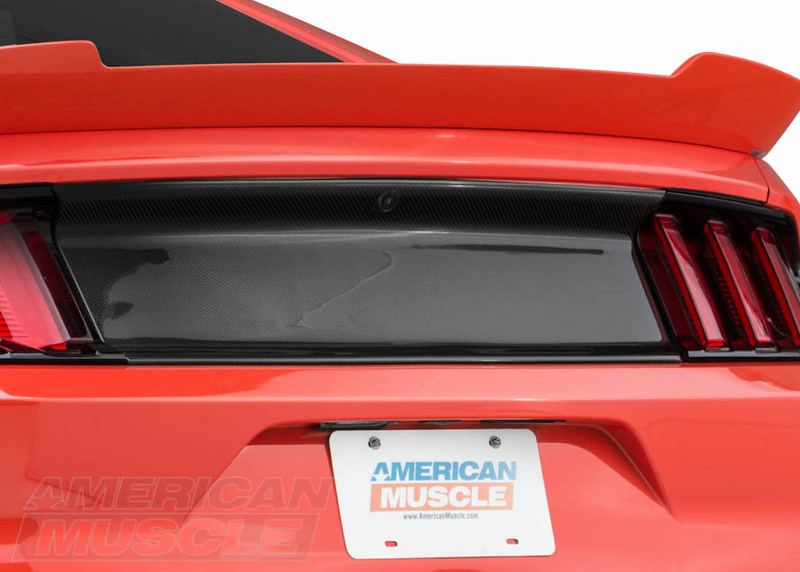 The honeycomb panel is a plastic piece that goes between the tail lights or if you want to use a decal, a black, flat black, or white vinyl can go in the same place instead. With all three of these decals installed it really changes the appearance of the back of the car for the better. 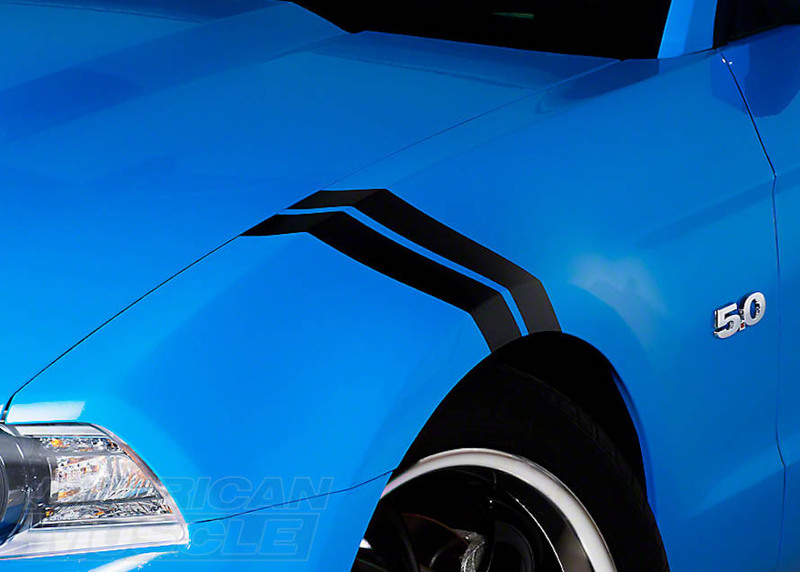 A set of racing stripes will look good on almost any car let alone a muscle car. They add some aggression and break up the paint color nicely if the appropriate color stripe is applied. There are a few options with strips. The lemans stripes are two evenly sized 12in stripes that go down the whole car, the GT500 stripes come in both 5in and 10in wide and send two stripes down the car similar to the lemans, and the Super Snake stripe which is a single 12in stripe with two ½ inch stripes right next to it on either side. The window decals are the most common amongst the group. People add windshield banners, quarter window stickers, and rear window decals quite often. This is probably because it is very easy to add decals to windows and they are really easy to take off as well. Glass is much more forgiving than the fresh paint on the body. You can put a windshield banner of your favorite performance company or maybe a running pony on the back window. 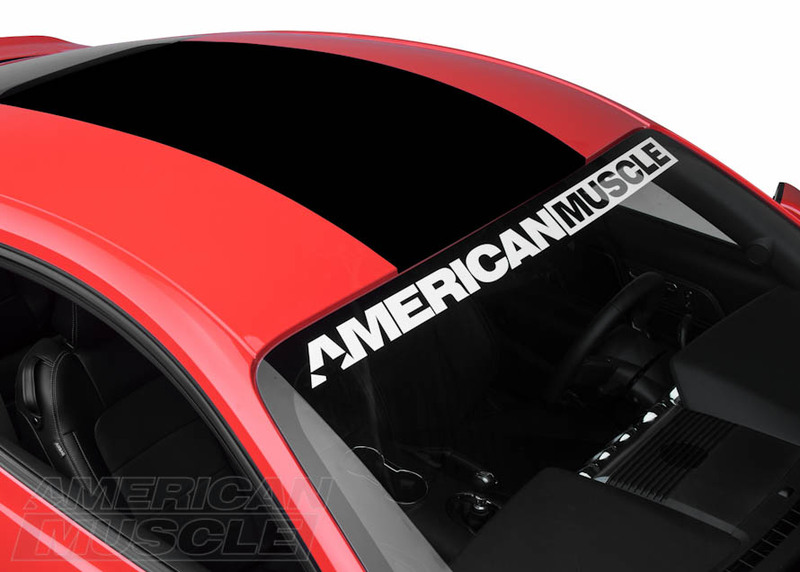 On 2005 Mustangs, you're going to run into an issue with roof decals; you'll have to remove the roof molding in order to make sure your graphic of choice installs smoothly. Be sure to see our installation guides for more details. On the other side of this coin, 1994-2004 Mustang owners are encouraged to remove the pillars prior to installation. Once your roof decal is in place, reinstall the pillars for a seamless look on your New Edge Pony. There is vinyl tint available if you’re looking to black out some of your lights or markers. 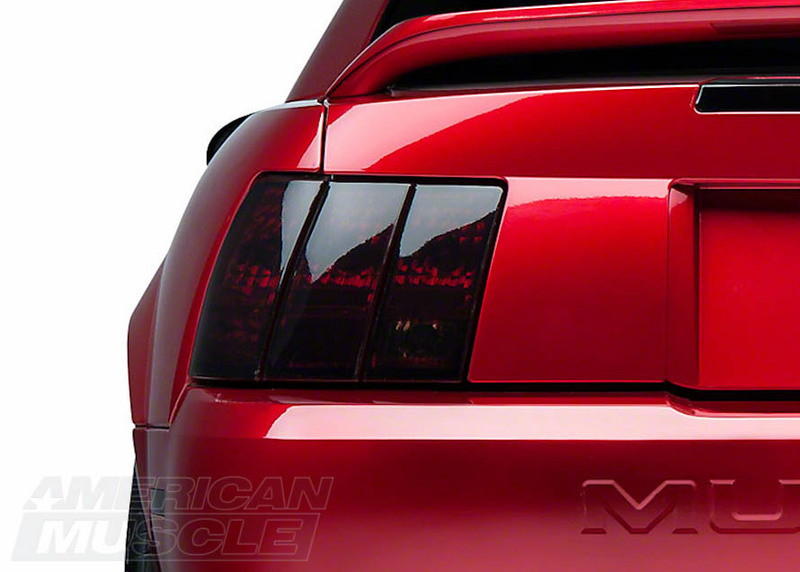 Tail light, third brake light, quarter marker, and fog light vinyl decals are all available to give your Mustang a more sinister and aggressive look and still allow just the right amount of light to shine through. All vinyl tinting is extremely affordable and easy to install. They are also very durable and are designed to last for years. If you’re looking to go a different route then consider rocker, fender, or hood decals to add a unique touch of styling. They all come in black, white or silver, and a select few colors. 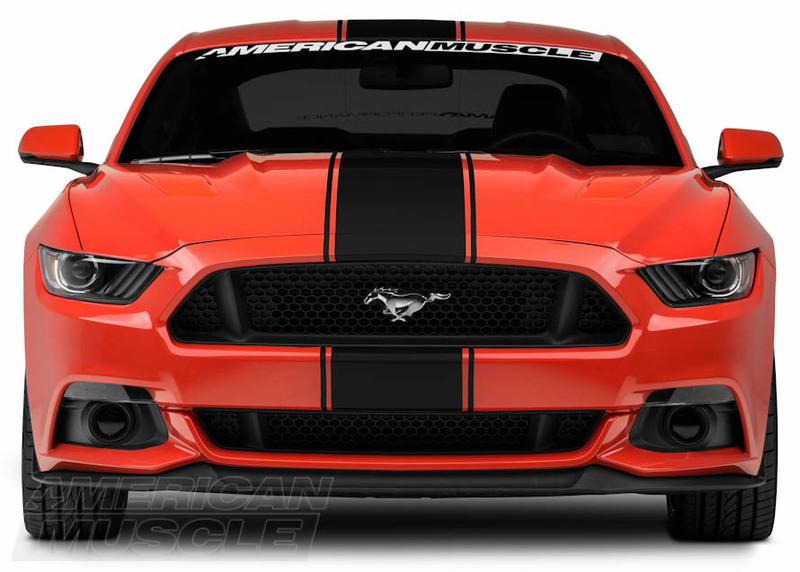 For the rocker, you can either get a solid stripe or one that says either “GT500”, “GT350, “American Muscle”, or “Mustang.“ Fender hash marks can also be applied to give your Mustang that race car inspired appearance. They are very affordable and can be applied within minutes. There are a lot of variations when it comes to hood decals. 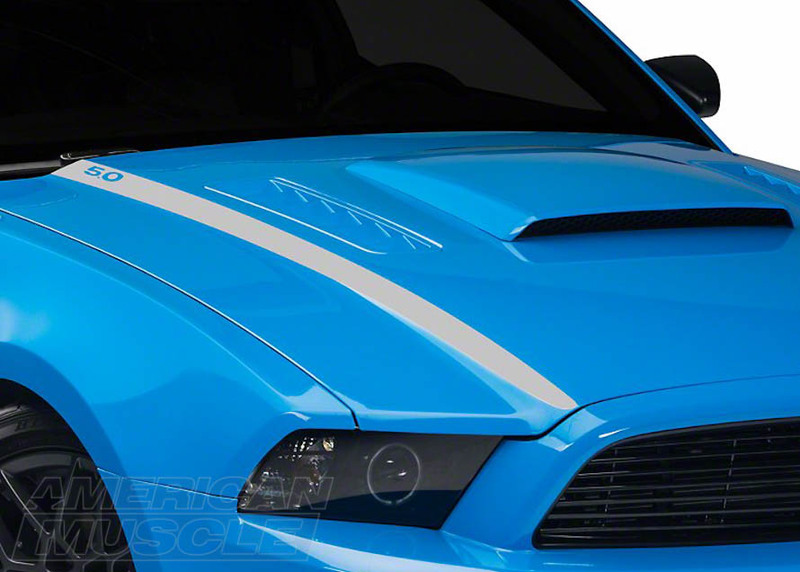 There are decals for the center of the hood identical to the Mach 1 stripe and others that are similar for the GT and V6 models. 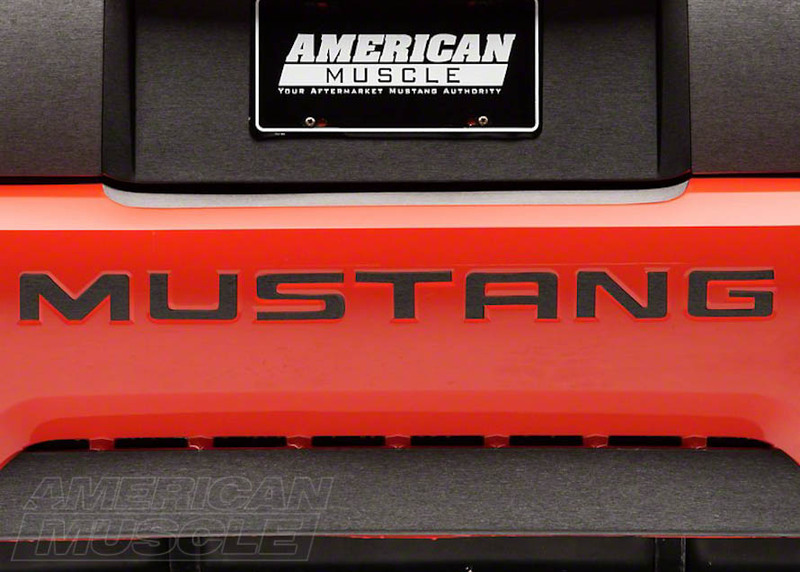 You can get hood accents that go on the side of the slight cowl in the factory hood or a decal that says “4.6L V8” that can be applied to the sides of the hood scoop if your Mustang is equipped with one. Hood decals are very popular and can still achieve the look you desire without the intensive labor of some of the other decal applications. Something you don’t see around town as often as full body stripes would be the race inspired hash marks. 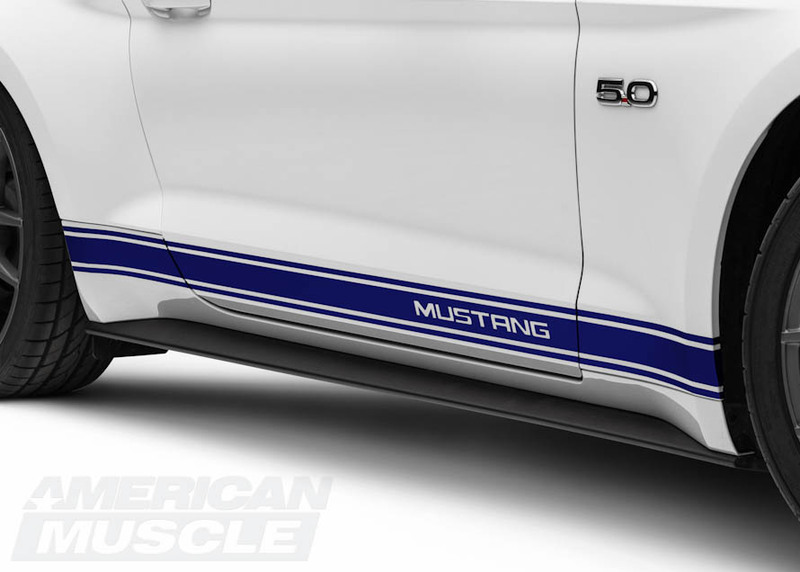 They come as a twin stripe that can be installed on either the driver side or passenger side of your Mustang, whichever you prefer. If you want both sides, just order two and you’ll be all set. These are significantly easier to install than body stripes so even if you don’t have much experience, this would be a great product to test out your skills. Just be sure to have a little patience your first time. 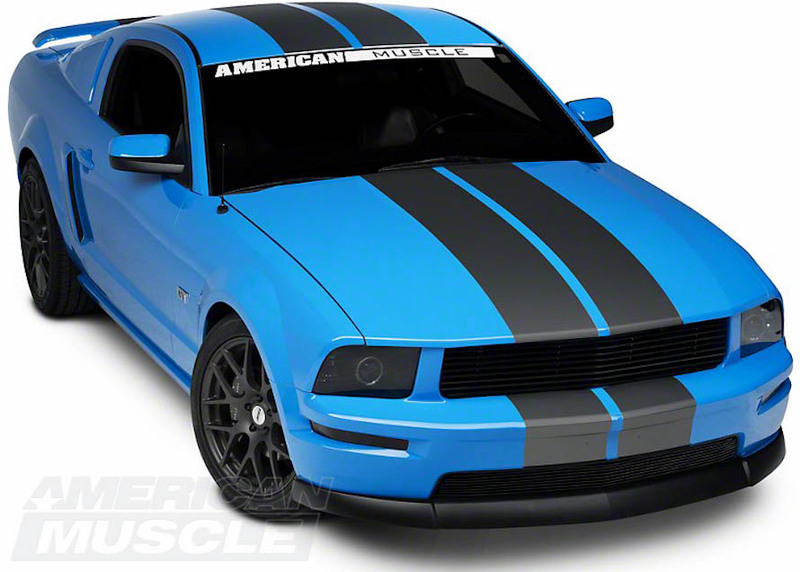 Hash marks are available in several different colors so you can get a set to match a set of full length stripes or your Mustang’s overall theme. Make sure you move the vehicle to a shaded area. You don't want the car's surface to heat up since this can damage the vinyl. Start by washing and drying your Mustang, using a lint free towel for drying. Other supplies you'll need: 32 oz. spray bottle, precision/hobby knife such as the brand X-Acto knife, masking tape, terry towel, and a squeegee. Use rubbing alcohol to prep the area where the vinyl will be applied. This will also remove any unwanted contaminants and waxes from the surface. After using the rubbing alcohol, clean the area of any residue left from the alcohol. Sometimes you will see a haze. This is from evaporation of the alcohol. You can use a terry towel and rub off excess. Now it's time to make the wetting solution. This will be for when it's time to apply the vinyl to the vehicle. The solution will let you adjust the vinyl if need be and make for a better experience applying your own graphics. Take the 32 oz. bottle and fill that with distilled water and 4 to 5 drops of baby shampoo. Before applying your vinyl, the outside air temperature should be around 55 to 80 degrees. You should apply the vinyl indoors, but for some of us, that isn't an option. If you have to apply your vinyl outside, make sure it is not a windy day as this can blow around particulates and also cause damage to the vinyl. Alright, let's get started. Make sure the vinyl you are going to apply is the right length before you try to install it. Always trim the vinyl after being applied. Place the vinyl where you would like it on your Mustang, and hold it in place with masking tape. This will allow you to be hands free and to take a few steps back to see if this position is desirable. If not just readjust. Once you have the vinyl in the desired location, you can make marks for alignment on the vehicle with a grease pencil. If you are applying Le Mans stripes, find the center of the vehicle and run a single line of painter's tape either 2" wide or 2 1/2"s wide. Once this is achieved, then the stripes would be applied to either side of the painter's tape in a perfectly straight line. Before applying the graphics to the vehicle, spray the mixture of water and soap onto the surface, but don't saturate it. Now remove the paper backing of the graphics and lightly spray that as well with the mixture. This will allow you to adjust accordingly and will not allow the vinyl to adhere until squeegeed into place. Now that you have the vinyl where you want it, use your squeegee and start from the center, working out, squeezing the water and the air bubbles from the underside of the vinyl. Starting in the center allows you to work outwards to the ends and not trapping the air. Great job! Your vinyl is applied. Now on to the final step. Time to trim using your knife. Trim where needed just be careful not to score the paint. This is also where you can take a pin and poke a hole in the air bubbles that did not get out when using the squeegee. All you need to do is poke a hole in the bubble and walk away. The sun will do the rest, meaning when the sun hits the bubble, it will push the excess air out and you won't even see there was a bubble there. YOUR DONE!! Stand back and admire your work. PLEASE ALLOW 24 TO 72 HOURS FOR THE VINYL TO CURE BEFORE WASHING YOUR MUSTANG.